Do you have a huge bed of rocky terrain covered in weeds? I do. It’s war every spring, summer, and fall using every trick known to man: grass killer, hedge clipper, weed wackers, shovels, child labor… Until a neighbor took pity on me and brought over his walk behind string trimmer. 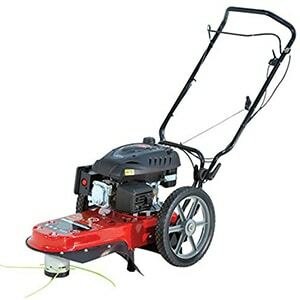 If you have a large area prone to unwanted vegetational growth that a lawnmower simply can’t handle, you may want to consider a walk behind string mower to take out whatever you need to wage war upon. WHY OWN THE FIELDS EDGE M220? Toted as the most versatile string trimmer on the market, the Fields Edge M220 mower includes a pivot wheel system for easy trimmer conversion and durable, high density cutting line. 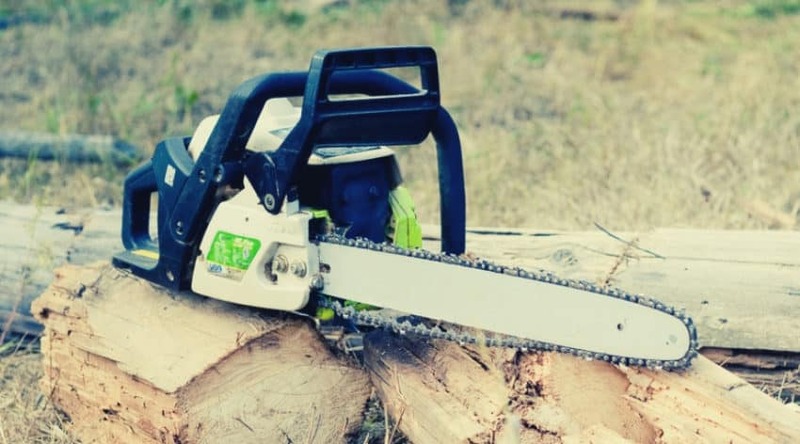 Updated from a previous version, the Clear-Cut cutting head is designed to make work easier and more efficient for the user, and the 173cc Viper engine is strong enough to handle anything in it’s path. 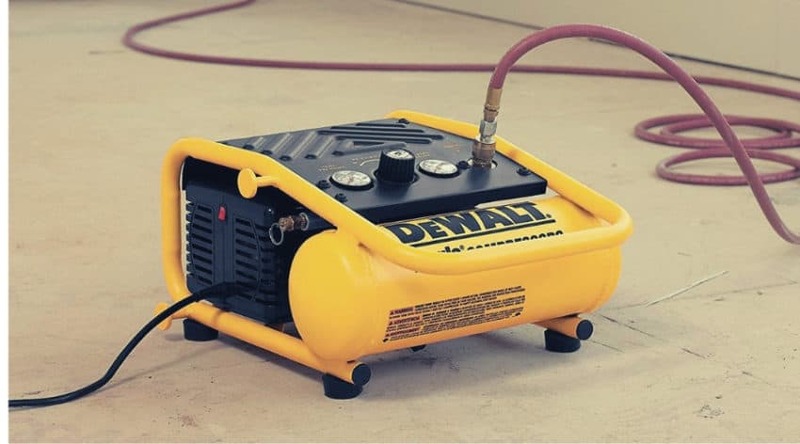 Not only is it a dual system machine, but it is both transportable and easily storable due to its quick folding design that allows you to get it out of the way in your shed, or packed into a car trunk to move from one location to another. This is a mower for the homeowner who needs to clean up some serious grass and weeds in uneven terrain. If you have a simple yard to cut and trim up, you may want to consider a simpler, more cost effective tools such as a handheld string trimmer. For a walk behind string cutter, this machine seems to pack a pretty powerful punch when it comes to getting rid of your unwanted vegetation. Check out the features below to see why this could be the tool you’ve always wanted for your property needs. This unique string attachment system can keep your line alive 4 to 5 times longer than other brands, and provides a dual layer cutting design. 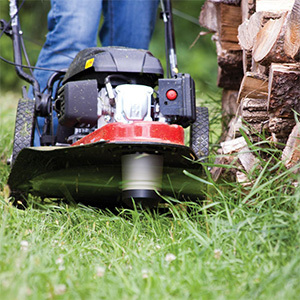 With this, vegetation is cut and blown immediately out of the way to keep the head running smoothly and efficiently. 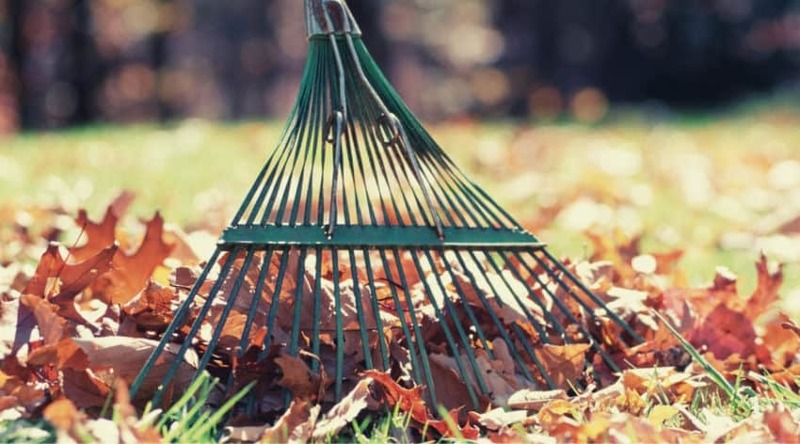 This is a convenient feature since getting through plants that are difficult to cut often jam up the best of your trimmer’s head, and having loose materials blown clear of the spinning mechanism will ensure that you won’t be wasting time cutting out spooled up grasses and tough weed stems. I’ve spent a lot of time backing mowers up when cutting through thicker growth to keep anything from tangling, so this sounds like a pretty interesting fix to that problem for me. 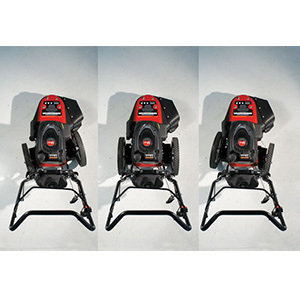 The only machine on the market to boast a stand-up wheel pivot system, this design feature allows you to get the cutting head into hard to reach places up against standing features for a close and neat trim. Wheels pivot to off-set the cut to get into the perfect position to manicure hard to reach areas. This is a breakthrough design to keep this mower competitive and more affordable to the buyer who needs a bit of versatility. Personally, I prefer a tool that can take care of more than one job. It not only saves on money in the long run, but time too! 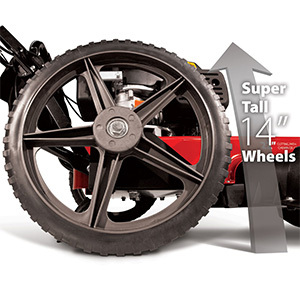 Large, 14” diameter wheels provide a sturdy base to get over uneven and rough terrain to get the job done. 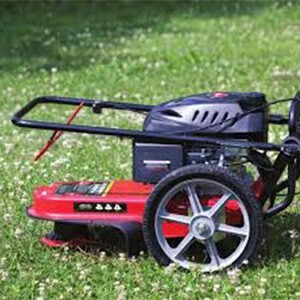 Let’s be realistic, you aren’t considering a string mower for a simple lawn manicure job- you’ve got an area that needs some serious attention every now and then that a regular lawn mower and hand held string trimmer isn’t able to handle well. Most mowers turn off when you release the handlebars, but this model comes with a head engagement bail that allows you to remove obstacles from your path without having to restart your engine. This is a safety feature that I love, this would make my life so much easier since I hate having to restart a pull mower and often try to maneuver around obstacles to bend down without actually killing the engine. I personally like this convenient little feature. It doesn’t seems like a make or break deal, but when I think about the open space wasted in my storage shed due to long handled machines, well it seems a no brainer to me. Simply release the tool-free cams and fold in the handlebar to create more space and less clutter! Plus, this also allows you move the mower around with more ease. If you are using it for more than one property, own a business, or simply are letting somebody borrow it – you don’t have to have a specific vehicle to haul it in anymore since it will fit nicely into a car trunk! Changing the string out couldn’t be easier with the simple slide through passage found in the cutting head. Simply cut your string to length, slide each piece into place and get back to work! This might be my favorite feature of any tool. Winding string must be done with just the right tension, direction, and placed just so to keep from overfeed and breakage. With this quick feed design you can replace your line and get back to work in just seconds. Shorter folk rejoice! You can now adjust the height of the handlebars to fit your comfort level to cut and trim with ease! 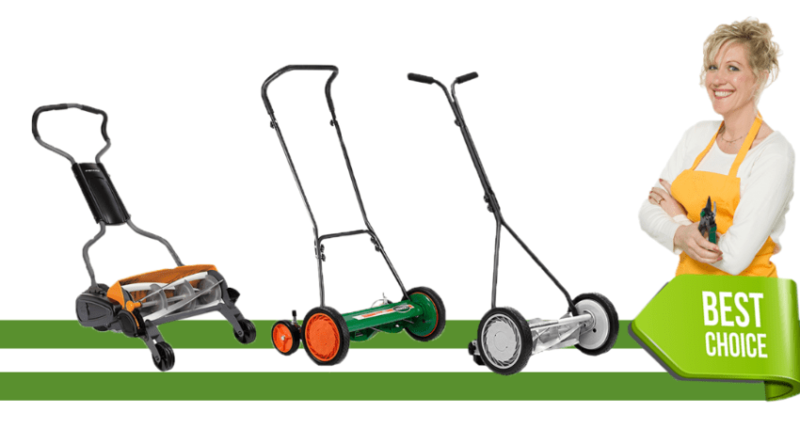 No more walking further behind for that extra ‘push’ and having to engage your upper body to keep a mower in motion! 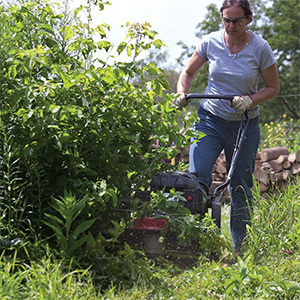 This is a great feature that will ease your back and allow you to put your efforts into getting the trimmer into the places you want the first time without a lot of pushing, pulling, and shoving. And no fear taller peeps! The height adjustment seems to be a great fit for just about any height, making it a versatile tool for multiple users. 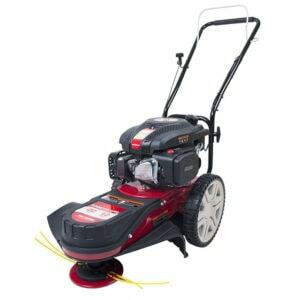 I’m rating the Fields Edge M220 mower at a 4 out of 5 stars since it has a ton of features that would be extremely beneficial for a person of my height and stature, stores well, and can get the job done in the heavy vegetation found on my property. 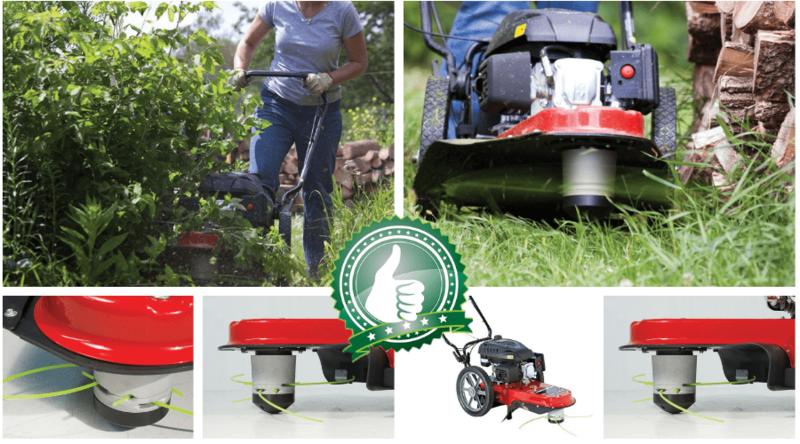 Positive rating overviews praise the overall capabilities of this model when cutting through heavy, wet vegetation, how it comes with everything needed to get started cutting immediately, the simple maintenance design, and its overall ease of use for most users. Concerns with some of the plastic used on the model suggests that with time it can become brittle and break, even though the parts are replaceable. Also, although the general consensus was that the string line feed was easy to do, if not checked for snugness, it could cause both cutting issues, and or fly out during use. It has been mentioned as well that it doesn’t always move over uneven terrain as easily as it claims, which, to me, is a possible deal breaker. The Remington Trimmer Mower boasts a 22 inch diameter cutting swath with an offset head to get into hard to reach places. It seems to have many similar features to the Fields Edge M220, but doesn’t include the unique pivoting wheel system or continual run handlebar. Despite having large, 14 inch wheels, the wheelbase is approximately only 12 inches in width, making it more difficult to get through thicker brush, although it does cut a 22 inch diameter fairly easily. 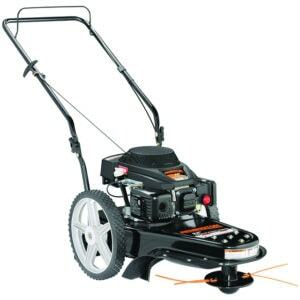 Good for areas that are too large for a handheld trimmer, but too small for lawn mower, the Husqvarna Hi-Wheel trimmer is a good tool for knocking down those pesky large weeds that insist on making an annual comeback. 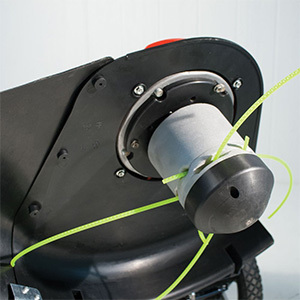 The mower engine and string are controlled separately, a feature similar to the Fields Edge M220 and which helps keep the engine from flooding if you need to stop work for any reason. It also totes an adjustable rim height so you can get a closer cut when needed. 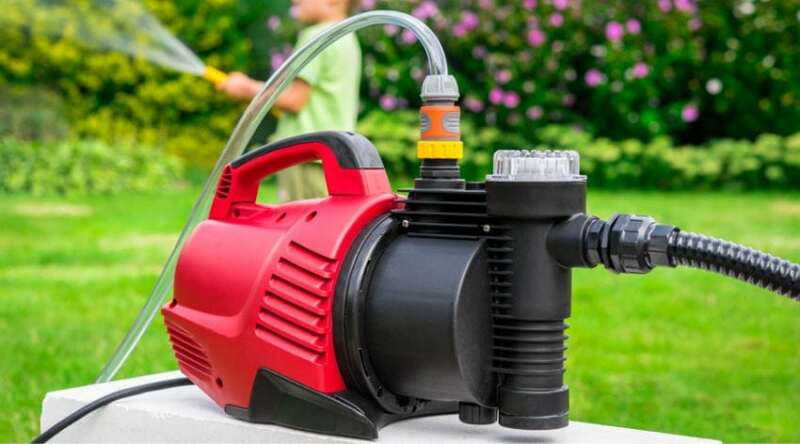 The Southland Outdoor Power Trimmer includes an anti-vibration grip handle for comfort that folds for easy storage and easy maneuverability through overgrown weeds and grasses. 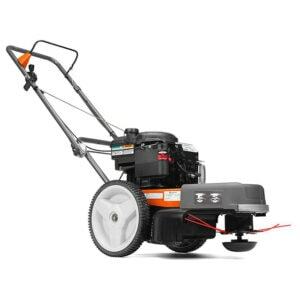 The wheels also have a wider wheel base to fully take advantage of the 22 inch cutting diameter for yard maintenance effectiveness, and yet get into spots unreachable by a standard lawnmower. This is definitely a smaller tool than the Fields Edge M220, but has many of the perks that receive a positive rating; such as the folding handlebars, and easily replaced trimmer strings. 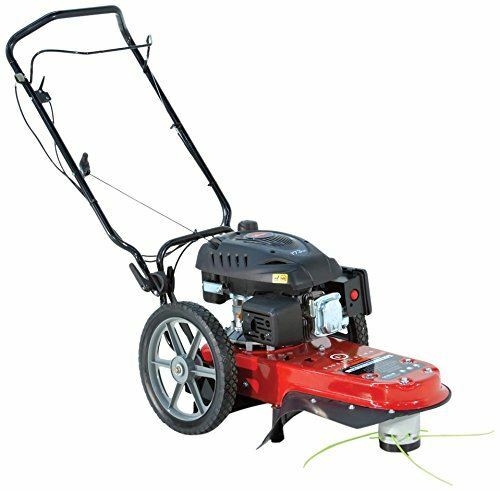 The Fields Edge M220 String Mower is an overall nice package deal for anyone looking for something that can handle tough, tall weeds and other vegetation that needs to go now. The Clear-Cut cutting head combined with the pivoting wheel system creates a versatile product that can be handled by almost any user of any stature in a variety of conditions. If this review of the Fields Edge M220 string mower has inspired you to go ahead to find your perfect walk-behind fit, or if you have any comments or questions concerning this particular model, feel free to share below!